Maryland has joined a growing list of states considering legislation to protect the unemployed. 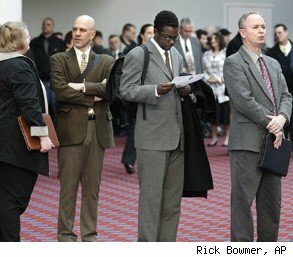 Legislators there are weighing a bill that would prevent employers from limiting applications for open positions to only those currently holding jobs. Advocates nationwide argue that such laws are needed given the millions of Americans who remain out of work, many of whom have been jobless for six months or more. But those allied with business interests say skills and worker readiness, which may have suffered during an extended period of unemployment, are legitimate criteria for determining applicants' suitability for open positions. The proposed legislation would add the words "employment status" to the list of criteria -- such as race, age and religion -- that employers can't use in determining applicants' qualifications, The Baltimore Sun reports. So far, only a handful of states have passed such laws, and the Maryland proposal is far from a shoo-in. The issue was brought to light last year, after an informal, nationwide survey of online job-search sites by the National Employment Law Project found numerous employment ads that said job seekers "must be currently employed." In a statement that accompanied its findings, the worker-advocacy organization called the practice "disturbing and unfair." The resulting publicity led some in Congress to call for legislation banning it. There are no laws barring employers from discriminating against jobless applicants at the federal level. For that reason, the Equal Employment Opportunity Commission doesn't track such complaints, so the extent of the problem isn't known. NELP policy co-director Maurice Emsellem told the Sun that it's difficult to determine how many job hunters have been affected by ads that include the discriminatory language. "No one wants to cop to the fact that they are doing it," he told the newspaper. In seeking to bar employers from hiring only those currently employed, Maryland joins a growing list of states considering similar legislation. As the Sun notes, New Jersey has already banned employers from discriminating against the unemployed in advertisements, while a comparable bill in Oregon awaits the governor's signature. Lawmakers in the District of Columbia have passed similar legislation. According to NELP, more than a dozen other states are considering such legislation, though a more limited proposal in Colorado, which would have banned discrimination in ads but not in hiring, was voted down while in committee last month. But backers in Maryland remain hopeful. Says Jackie Gray, a Baltimore activist and supporter of the proposed law, "It's about changing minds or changing attitudes, and then changing behaviors of the employers and the people who represent the employers."